The Compassion Center is offering a FREE Intro to Meditation Class so that people can learn how to meditate. This class takes place every Monday, from 7:45 to 9:00pm and Sunday from 9:30-11:00am. If you have never learned how to Meditate, have never taken a formal Meditation class, or would like to get back to the basics and start a new Meditation program, you are invited to this free class. To sign up for this class, simply click here to sign up for our FREE Intro to Meditation Class. Meditation can be successfully used to alleviate anxiety, depression, stress, anger, compulsive behavior, and trauma. It can be used to help people going through substance abuse recovery and also help those who have been affected by loved ones who are deep into addiction. It can be used to generate loving kindness for others as well as ourselves. Meditation is often misunderstood by some people who think that it is a religious practice or a form of hypnosis. We teach a form of Meditation that is neither religious nor is it a form of hypnosis. It is a process where our teachers help you to address the issue(s) that you face in your life through a set of very specific exercises. These exercises include bringing focus to the reason why you wish to Meditate (we refer to this as the “Motivation”), bringing focus to the posture and body so that we can relax, and bringing focus to the breath. It is a set of guided instructions which will relax you and allow you to remove the obstacles in your life. Learning how to Meditate can be a fun and rewarding process. Just as we may go to the gym and see improvements in our body and physical abilities after a few weeks, in Meditation, we also experience gains. These gains include feeling less anxious, feeling less stressed, being able to fall asleep easily and getting a good night’s sleep, and feeling happy each and every day. Some people start to experience these wonderful benefits in as little as 1-2 weeks. It is very common for people who attend our Meditation classes to have their spouses, family members or friends say “hey, there’s something different about you…you look happy”. Most of us were never given the proper tools that we needed to cope with difficulties in our lives. Many of us have turned to alcohol and other substances to cope with these difficulties because we lacked these proper tools. Meditation is one of the very best tools that you can use to address just about any difficulty that you face in your life. It’s very easy to learn, only takes approximately 20 minutes of each day to practice, and it reaps incredibly positive rewards the more you do it. 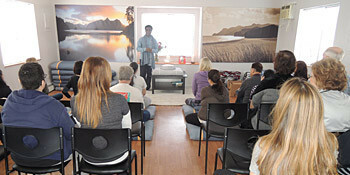 Please visit The Compassion Center, take advantage of our Free Intro to Meditation Class, learn how to meditate, and start your journey to live a happier and healthier life.